What is the source of the drugs vicodin, percocet, oxycodone, oxycontin & percodan? The original source of the molecules used to make these painkillers is the opium poppy. A molecule called thebaine is isolated from the opium poppy. Thebaine is then used to make many prescription painkillers. Currently, fifteen countries legally grow opium poppies for use in pharmaceuticals. These include: Australia, China, France, Hungary, India, Japan, Spain, Turkey and the United Kingdom. Oxycodone was first created by the German pharmaceutical company Bayer (the same one that makes aspirin) because they stopped selling heroin due to problems with addiction. It was hoped that a thebaine-derived drug would retain the painkilling effects of heroin with less of the euphoric high which leads to addiction. Unfortunately, this was not the case. 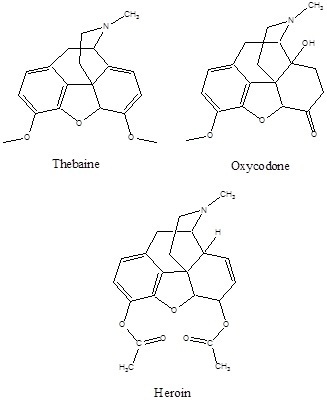 When looking at the structures of thebaine, oxycodone, and heroin, it is easy to see that their structures are quite similar and therefore easy to believe their effects are similar. It is interesting to note that painkillers are considered the most abused prescription drugs in the United States. Also, painkillers (opioids) are one of the most prescribed class of drugs in the United States. What is the most toxic substance known? The most toxic substance known is the Botulinum toxin, a neurotoxic protein produced by the bacterium Clostridium botulinum. Ingestion of this toxin produces botulism. A typical lethal dose = 0.00000002 grams, meaning that one hundred grams could kill every human on earth. Another way to consider its toxicity to realize it is 40 million times more powerful than cyanide. By blocking neurons, the toxin renders the muscles unable to contract for a period of 4 to 6 months. Death is generally caused by suffocation due to the paralysis of respiratory muscles. Oddly enough, the muscle paralyzing properties of the Botulinum toxin has been utilized in medicine to treat: muscle spasms, migraines, excessive salivation, and uncontrollable blinking. During the use of the Botulinum toxic to treat eye muscle disorders, it was noticed that the frown lines between the eyebrows were softened. This effect was quickly capitalized on to produce one of the most common cosmetic procedures in the United State, Botox. Think Spray-On Sunscreen is safe? Try a fireball! I am a university professor who holds a doctorate in organic chemistry. In addition to working in the industry for a short while I have taught general and organic chemistry courses at three different campuses. After teaching chemistry for a while I, noticed that the more interesting and edgy aspects of chemistry were never discussed in textbooks and in lectures. As a student I remembered that any stories told by instructors, which ties the material in with real life, tended to have a dramatic impact on me. To that end, I have created this blog to highlight the many strange ways chemistry shows up in our lives.